AAATalks / Go Magazine / Carolinas / Coastal / Your Weekend Guide to Charleston, S.C.
A quick getaway to Charleston, S.C., is always an easy decision for our family. It’s one of my favorite places, so I’ll never pass up an opportunity to get down there. 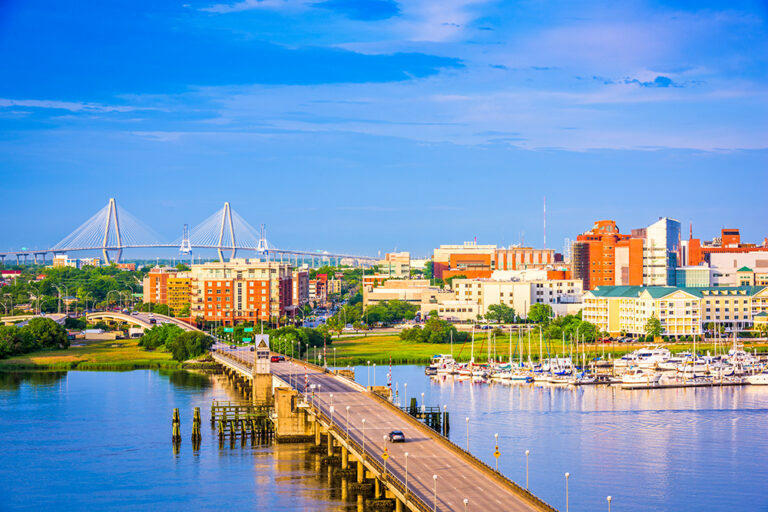 Boasting everything from historic tours and sundrenched beaches to eclectic dining options and varied accommodations, it’s not surprising that Charleston was recently named “Best City in America” for the fifth year by Travel + Leisure readers (among other accolades). Charleston is replete with AAA Four Diamond accommodations to match every travel style. Do you seek the intimacy and charm of a historic or boutique stay? Check out Ansonborough Inn, French Quarter Inn, HarbourView Inn, John Rutledge House Inn, Planters Inn, Renaissance Charleston Historic District Hotel or The Restoration. Do you prefer a luxury getaway? Consider the Belmond Charleston Place, Grand Bohemian Hotel Charleston Autograph Collection or The Spectator Hotel. 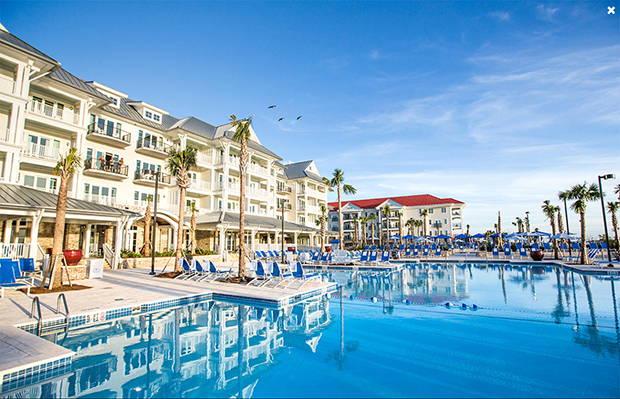 Our home base for the weekend was AAA Four Diamond rate The Beach Club at Charleston Harbor Resort & Marina. Any stress I was holding onto from the previous busy week seemed to dissipate the moment I walked up the expansive front porch. The wraparound porch with comfy rocking chairs and the amiable doormen who greeted me exuded southern hospitality. That friendly, Lowcountry vibe continued when I stepped inside. It felt like home — like I was visiting a friend’s southern estate. That was the intent when it came to choosing the resort’s maritime inspired decor, according to Nick Saltmarsh, General Manager. “We wanted it to feel like home,” he explains. “All the furnishings are residential home furnishings, not hotel grade.” The vibrant, hand-tufted lobby rugs were made in England, and the custom designed carpets from Patrick James and nautical accents are just a few of many impressive design touches you’ll find here. Our room, a Family Parlor Room, was just as lovely as the rest of the resort. It provided ample space with a separate room for the girls and an expansive bathroom that included a large soaking tub and separate shower. I really appreciated the bathroom’s designated vanity space with a lighted magnifying mirror. It was a nice change from hunching over my small sink to do my makeup and hair. Our stay also included a cool Official Charleston Area Complimentary VIP Pass from Explore Charleston, which provides free admission to a great selection of Charleston museums, attractions and tours. The resort is situated on Patriots Point just across the harbor from downtown Charleston, providing Instagram worthy views of the USS Yorktown, the marina and the city beyond. We enjoyed dinner at the Fish House. The sunset view from our table was fantastic, and our meals were all on point. Their menu features locally-sourced sustainable seafood, produce and vegetables and the wine list is extensive. Other on-site dining options include the Beach Club Tiki Bar (located by the pool) and the Bridge Bar, the area’s only rooftop bar that overlooks Charleston’s entire skyline. Dining downtown is easy with the resort’s complimentary hotel trolley service or nearby water taxi. I scoped out dining options for veggie lovers and honed in on Dell’z Uptown before we arrived in Charleston, so we made plans to eat an early lunch there on Saturday. It’s been voted one of the best vegetarian restaurants in the U.S. by Travel + Leisure readers, and they serve a nice variety of vegan, vegetarian and meat friendly menu items. Not surprisingly, we arrived as soon as they opened at 11 a.m., and there was already a line. Service was quick, though. The dining area was small with community style seating and we grabbed a table post haste. We ordered the vegan BLT wrap, the vegan Chick’n and Tempeh Bacon wrap, the Cannon Corner wrap and the nachos platter. It was SO good. A return trip to Dell’z is inevitable. After lunch, we tucked into Charleston’s Market Hall and City Market. I’m a sucker for locally made souvenirs, and it had been a few years since I’d been there. It was inside a dog’s mouth hot that day, but I didn’t want to miss a booth. Handmade soaps and bath bombs, colorful baskets and linens, and small batch sauces and mixes — there was so much to see (and buy!). 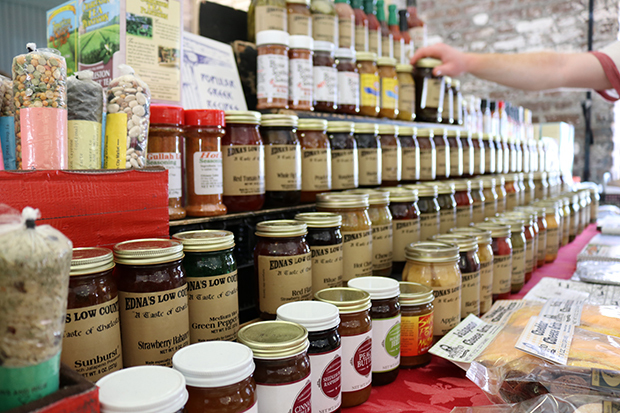 Whaling Co., Zulu Wire Baskets, Edna’s Low Country and Carolina Islands Soap Works were a few of my favorites. We tooled around town a bit more, checking out art galleries and shops. The refreshingly cool waters of the Charleston Harbor Resort pool seemed to be calling us, though, so we headed back to the resort for the rest of the afternoon. A favorite of both locals and tourists, Vickery’s Shem Creek Bar and Grill was our choice for Saturday’s dinner. With water views from just about every table, there’s no bad seat here. Dine inside or on the deck overlooking Shem Creek. There’s also a nice dock walkway next door so you can walk off some calories. We sampled a little bit of everything — vegetable spring rolls with Tai sauce, black bean burger, Cuban sandwich and blackened salmon. We were completely sated. It was a busy Saturday night, but service was quick without feeling rushed. We wanted to explore a little longer before we had to leave Charleston, so we headed downtown to stroll along Meeting and King streets. Our first stop was the Charleston Visitors Center, which should really be the first stop for everyone’s visit to Charleston. You’ll find a plethora of helpful information about attractions, tours, restaurants and accommodations. Across the street is the Charleston Museum. Highlights here include an exhibit with artifacts dating back to the settlement of Charleston, “Dave” jars and other pottery crafted by African American slaves, weaponry from both the Revolutionary War and Civil War, and some of Francis Marion’s personal belongings. Part of a museum visit includes a tour of two prominent historic homes — the Joseph Manigault House and the Heyward-Washington House. Other fun spots we popped into included the Art Mecca of Charleston, located at 427 King Street. It teemed with a varied selection of artwork, jewelry, photography by local emerging artists. As we continued to meander around town, the sweet aroma from Jeni’s Splendid Ice Creams lured us easily, and was a nice treat on a hot day. Between licks, my daughter happily noted: “This isn’t like any chocolate ice cream I’ve ever tasted!” The rich flavors are created by using whole ingredients and dairy from grass-pastured cows. Lemon and blueberries, sweet cream with peanuts and molasses curd and cream puff are a few flavors you might find when you visit. Though we didn’t have time this particular weekend, we’ve toured the South Carolina Aquarium on previous visits, and I highly recommend it. 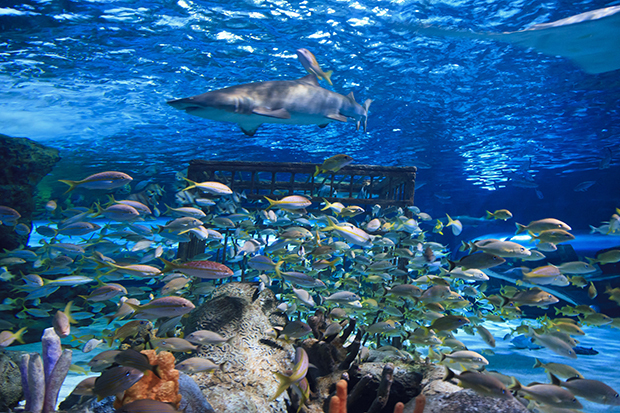 The aquarium is home to over 5,000 animals that hail from varied regions within South Carolina. Exhibit areas include Coastal Plain, Piedmont, Mountain Forest and others. The aquarium also includes the Sea Turtle Care Center, which encompasses all aspects of South Carolina Aquarium’s sea turtle rehabilitation efforts. Guests can get a peek into the inner workings of the care center at the Zucker Family Sea Turtle Recovery exhibit. Don’t forget to use your AAA Membership card when you visit — members save up to $3 on tickets to the aquarium. Another way to pass the time in the Charleston area is on the beach. There are certainly plenty to choose from. For a laid back, local vibe (and solid surfing opportunities), head to Folly Beach. Dolphins are also known for hanging out around Folly. Escapists will appreciate Bull Island, a pristine natural habitat you can access via the Garris Landing ferry. It’s part of the Cape Romain National Wildlife Refuge and a good spot for birders (you can spy almost 300 species of birds here). Nearby Kiawah Island is the ideal spot for a luxury getaway and where you’ll find the state’s only AAA Five Diamond resort, The Sanctuary at Kiawah Island Golf Resort. A Charleston road trip is always a good option. Every time I visit, I find something new to explore. If you’re ready for your own road trip, make sure to first check out all the Charleston area discounts for AAA Members! Bulldog Tours, Bubba Gump Shrimp Co. and Sandlapper Water Tours are just a few places AAA Members can save! Hot in the City: Raleigh, N.C.